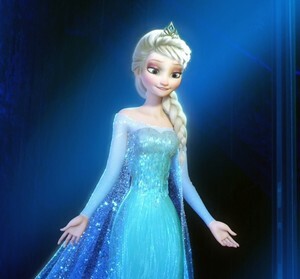 Elsa in new hairstyle. . Wallpaper and background images in the 엘사와 안나 club tagged: photo. This 엘사와 안나 photo contains 겉옷 and 가운. There might also be 저녁 식사 드레스, 저녁 드레스, 정장, 이브닝 가운, 저녁 가운, 공식적인, 신부 드레스, 웨딩 드레스, 신부 가운, 웨딩 가운, 볼 가운, and 공 가운.